What's cuter than an Easter Bunny? YOGA GOATS! Come spend time with the family Easter Weekend at a Summerville Goat Yoga Class! We may not have bunnies, but we have cute goats and chickens that lay colored eggs! It's basically the same thing! 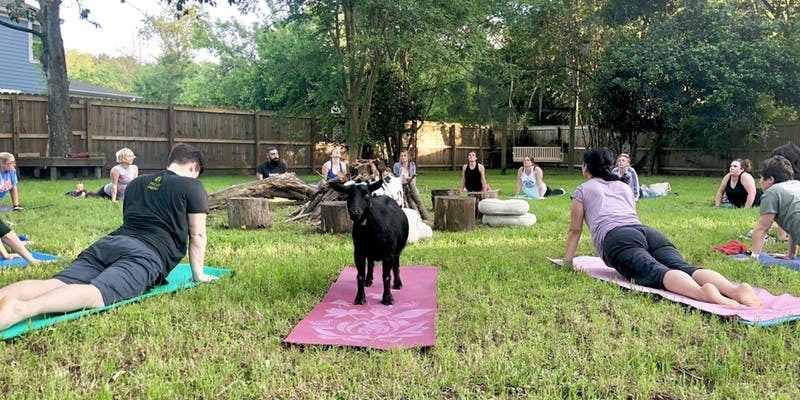 Welcome to Summerville Goat Yoga at Flowertown Charm! We were the first to bring GOAT YOGA here to the Lowcountry, so you've "GOAT" to take a class with us! Goat Yoga is a casual and gentle yoga class, with goats! Perfect for those new to yoga, pro yogi's, or those who just want to snuggle with silly goats! So basically everyone! OH MY GOATNESS! It is as fun as it sounds! Our goats roam around, cuddle, and headbutt each other to play, all while in your yoga poses. We have an urban mini-farm in our beautiful backyard under the trees at our historic farmhouse, which is the ultimate relaxing spot for our class! We have collaborated with Yoga with Joe to bring a fun, stress-relieving, happy class, with our goats! We think this combination is perfect for making you smile all while calming your soul. The yoga class will be an hour long, and if you can't "goat" enough you can stay for goat happy hour after class! During goat happy hour you can hang out, snuggle, and take pictures with the goats. Also, BYOB if you wish! The classes will be held at “Flowertown Charm” which is our home business and due to limited parking we ask that you park in the back parking lot of “Stallsville United Methodist Church” and we will walk a block over to Flowertown Charm together as a group. So please arrive a couple minutes early. Goat Yoga is a gentle class combining the benefits of yoga with the fun-loving connection with goats. Goats are silly creatures that will bring you joy and laughter all while calming your soul and de-stressing your body and mind.